Money order is a paper document similar to check that is prepaid for the certain amount. It does not require a check account and may be issued by banks, post, money transfer companies, etc. Configure check/money order integration to enable check/money order as a payment method in the system. 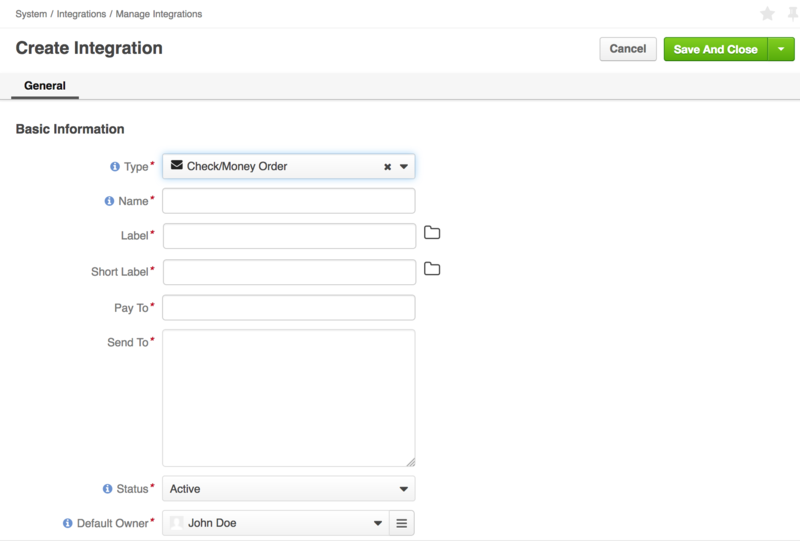 On the Manage Integrations page, click Create Integration. Type – -Select Check/Money Order for Type. Name — The payment method name that is shown as an option for payment configuration in the OroCommerce management console. Label — The payment method name/label displayed as a payment option for the buyer in the OroCommerce storefront during the checkout. To translate the label into other languages, click on the icon next to the field. It may not include the payment processor name if you want to hide it from the buyers. For example, you can enter ‘Credit Card Payments’ if you have a single payment method configured for processing credit cards. Short label — The payment method name/label that is shown in the order details in the OroCommerce management console and storefront after the order is submitted. To translate the label into other languages, click on the icon next to the field. Pay To — Provide the name of the company or a person to file the payment to. Send To — Provide directions and the address to send the check or money order to. This information is shared with the customer together with other payment instructions at checkout. Status — Set the status to Active to enable the integration. Next, set up a payment rule that enables this payment method for all or some customer orders via the Payment Rules Configuration page.